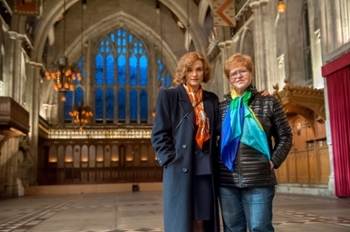 Deborah Lipstadt, MA’72, PhD’76, says fame hasn’t changed her one bit: She’s still cantankerous, combative, loud and tough. Her friends tend to agree. Lipstadt will return to Brandeis on Sept. 22 for a special 6 p.m. screening of “Denial,” and a talk-back after the movie with filmmaker Errol Morris. President Ron Liebowitz will present Lipstadt with the Brandeis Alumni Achievement Award, the highest honor the University bestows exclusively on alumni. The award recognizes alumni for distinguished contributions to their professions or chosen fields of endeavor. List of past winners. While Lipstadt maintains she’s still the same person, she recognizes that the volume on her microphone has been turned way up. She is no longer simply a Holocaust scholar with a high profile in the world of academia. Once the movie has its full release on Sept. 30, she will be known by millions and millions of people around the world. While the type of Holocaust denial that Irving peddled has largely been discredited except in the Arab world, Lipstadt maintains that “softcore Holocaust denial” still exists. Lipstadt looks back on her days at Brandeis with great fondness. She arrived on campus in the fall of 1968, just as the field of Jewish studies was becoming an increasingly popular and respected area of academic inquiry. While at Brandeis, she focused her research on contemporary Jewish history, worked closely with Professor Benjamin Halpern and wrote her dissertation on American Zionist leader Louis Lipsky. Lipstadt became the 100th individual to earn a doctorate from Brandeis.